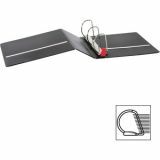 Cardinal EasyOpen Locking 4" 3-Ring Binder - Reference binder features One-Touch EasyOpen rings that open, close and lock with one simple motion. Design was awarded the Ease-of-Use Commendation from the Arthritis Foundation. Locking Slant-D rings hold 25 percent more than standard round-ring binders. Back-mounted steel rings provide a clean, professional spine and reduce wear. 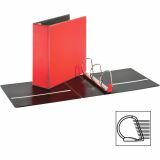 4" ring capacity holds approximately 700 sheets. 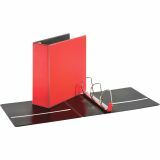 Heavy-duty construction features durable poly and a sturdy chipboard core. Transfer-safe, PVC-free polypropylene will not damage photos or documents. 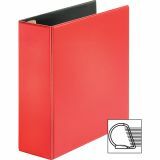 Letter-size binder also includes exposed rivets and horizontal inside pockets for loose documents. Each pocket holds 40 sheets. Binder is made with a high percentage of recycled content.